This photo is before they are cooked. So easy to make, why buy them? This recipe makes about 10. In a large bowl, mash the bread and milk together with a fork to form a chunky paste. Add the salt, pepper, garlic, worcestershire sauce and ketchup and mix well. 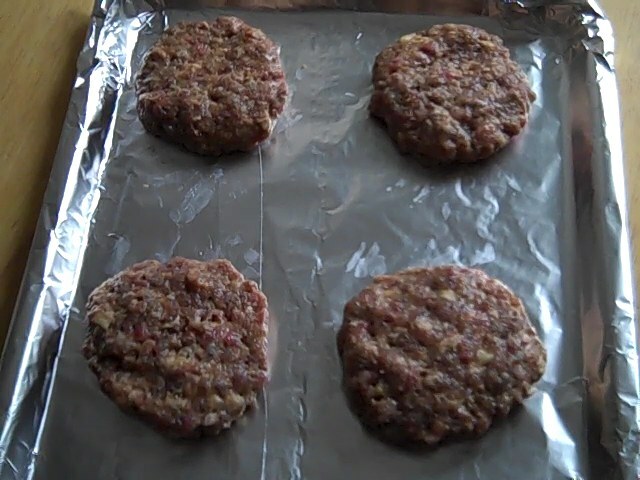 Add the minced beef and break up the meat with your hands. Gently mix everything together until just combined. Divide the mixture into 10 equal portion and form loose balls. Gently flatten the balls into round patties. When your ready to cook them, making a slight depression in the centre of them will stop them from puffing up under the grill. Grill for 3 -4 minutes each side, depending on how thick you make them. Always check they are cooked through properly.